Over the weekend I was on a Civil War history tour with the inimitable Ed Bearss. Another tour participant was a fellow civil war image collector and a re-enactor who talks about Civil War medicine. He also works for the Civil War Medical Museum in Frederick, Maryland. 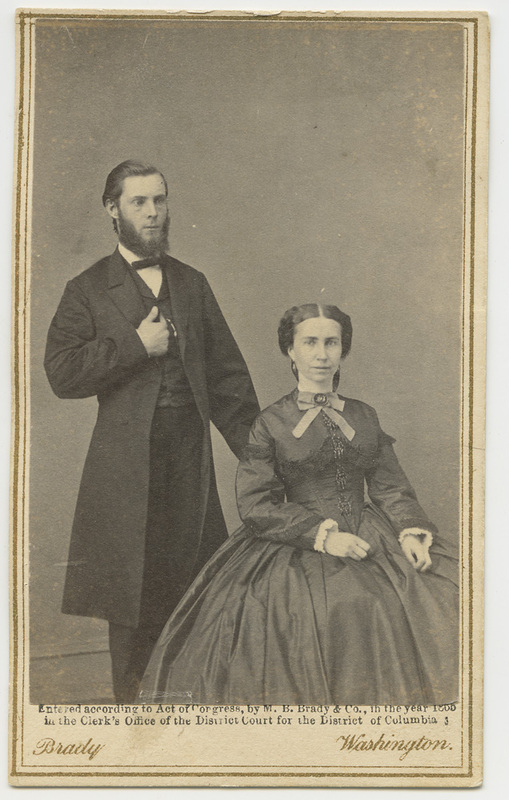 We were discussing images in our collections and he too has a copy of this CDV, and even without my prompting, described it as Clara Barton and John J. Elwell. I’m still going to take some time to go down to the Library of Congress to try and verify the image in their collection. But it’s good to know that I’m NOT alone in my interpretation of who these sitters are. 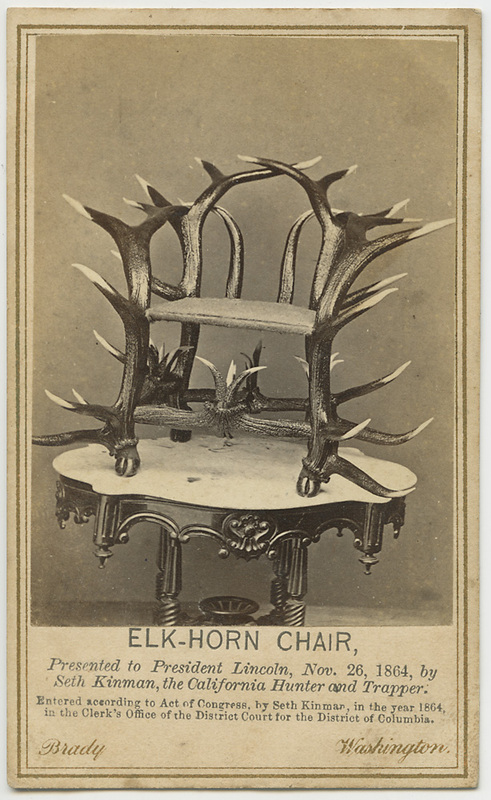 Ok- it looks like the elk horn chair Seth Kinman gave to President Lincoln made the photo studio rounds in 1864. 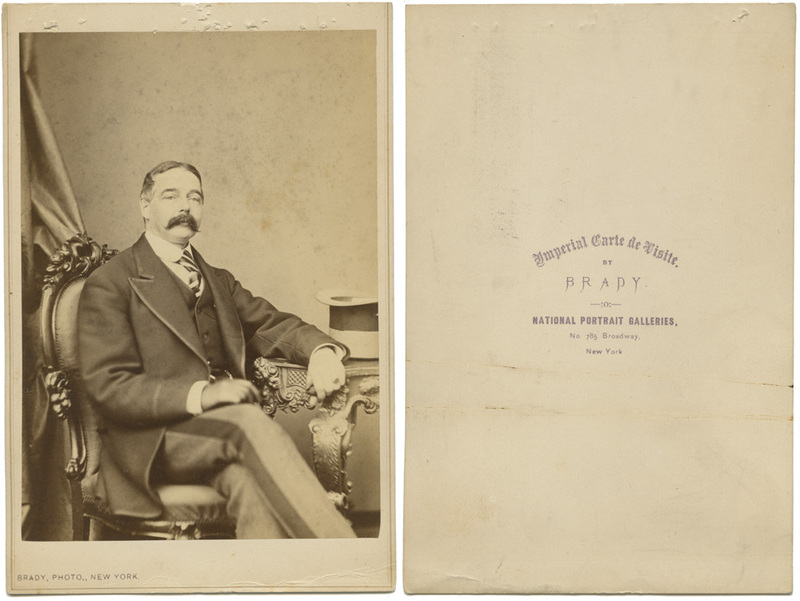 I now have a copy of the Brady version of the chair’s portrait, along with the Alexander Gardner version. In perusing the Wikipedia article, there appears to be at least one other Brady version of the Kinman-Lincoln chair. I’m trying to find out the disposition of the chair today – it may be part of the White House collections, or it may belong to the Smithsonian. I’ll update when I find out. 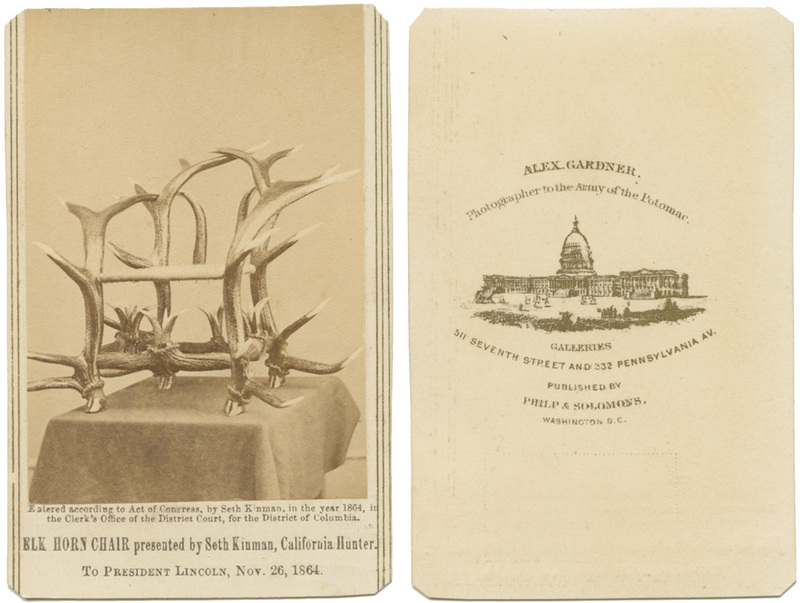 Kinman’s presentation of an elkhorn chair to President Abraham Lincoln at 10 a.m. on Saturday, November 26, 1864 was recorded by artist Alfred Waud, the only known picture of Lincoln accepting a gift. The drawing shows Lincoln examining Kinman’s rifle, which he called “Ol’ Cottonblossum.” Kinman also presented a fiddle made from the skull and a rib of his favorite mule and played the instrument. Much to the amusement of Lincoln and other spectators, he played ‘Essence of Old Virginia’ and ‘John Brown’ on the bones of the mule. Lincoln said that if he could play the fiddle he would ask him for it, but since he could not, the fiddle would be better off in Mr. Kinman’s hands. Within three weeks, Lincoln stated that he would prefer to eat Kinman’s chair, antlers and all, than to appoint a certain office-seeker. The following April, Kinman marched in President Lincoln’s funeral cortege in Washington. Seth Kinman (September 29, 1815 – February 24, 1888) was an early settler of Humboldt County, California, a hunter based in Fort Humboldt, a famous chair maker, and a nationally recognized entertainer. He stood over 6 ft (1.83 m) tall and was known for his hunting prowess and his brutality toward bears and Indians. Kinman claimed to have shot a total of over 800 grizzly bears, and, in a single month, over 50 elk. He was also a hotel keeper, barkeeper, and a musician who performed for President Lincoln on a fiddle made from the skull of a mule. Known for his publicity seeking, Kinman appeared as a stereotypical mountain man dressed in buckskins on the U.S. east coast and selling cartes de visites of himself and his famous chairs. The chairs were made from elkhorns and grizzly bear skins and given to U.S. Presidents. Presidents so honored include James Buchanan, Abraham Lincoln, Andrew Johnson, and Rutherford Hayes. He may have had a special relationship with President Lincoln, appearing in at least two of Lincoln’s funeral corteges, and claiming to have witnessed Lincoln’s assassination. His autobiography, dictated to a scribe in 1876, was first published in 2010 and is noted for putting “the entertainment value of a story ahead of the strict facts.” His descriptions of events change with his retelling of them. Contemporary journalists and modern writers were clearly aware of the stories contained in the autobiography, “but each chooses which version to accept. 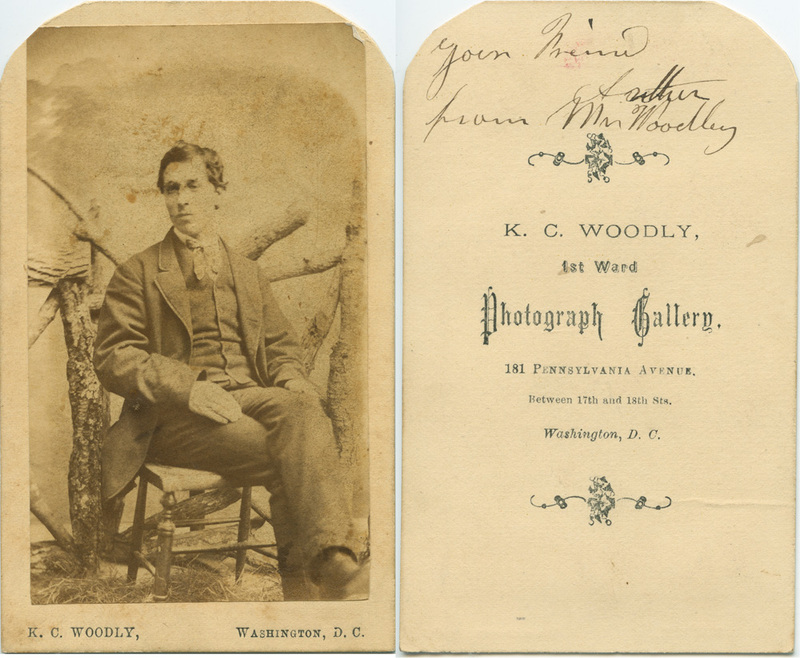 Here is a CDV by Brady from his later years at his Washington DC studio. The subject is R.J. Arnold, who went on to have a career as a photographer in California. For more information about Mr. Arnold, there is a very nice website about California photographers from the 1870s-1990s at CAViews.com. It is seldom that you find photographs of early photographers, so this was a neat acquisition for me. I have one other image that I believe is of a photographer (the label is vague – it could be the photographer himself or it could be merely inscribed by the photographer to the sitter). Images of photographers with the tools of their trade are, unfortunately, extremely collectible and therefore out of my budget. 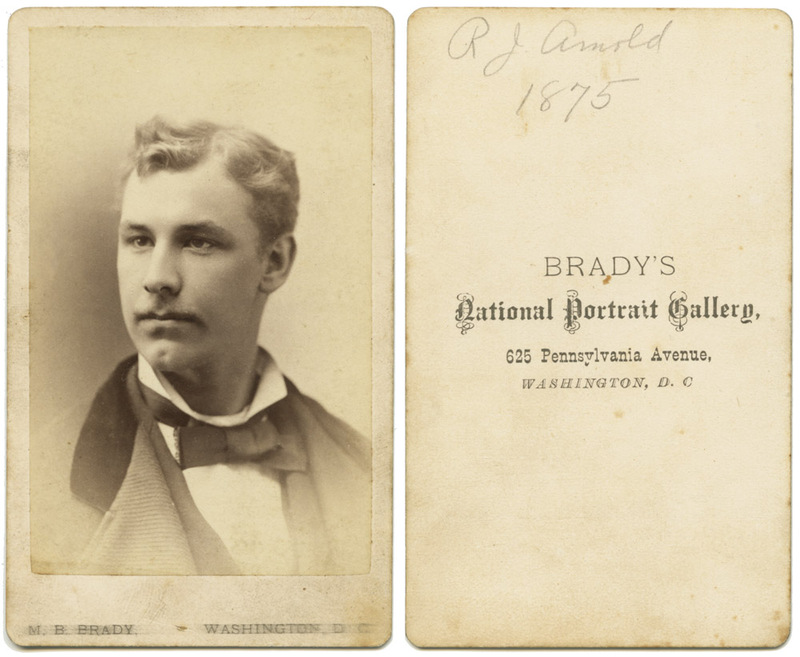 But this photo of Mr. Arnold as a young man fills a nice niche as a stepping-stone to the goal of a cdv or tintype of a photographer with his camera. 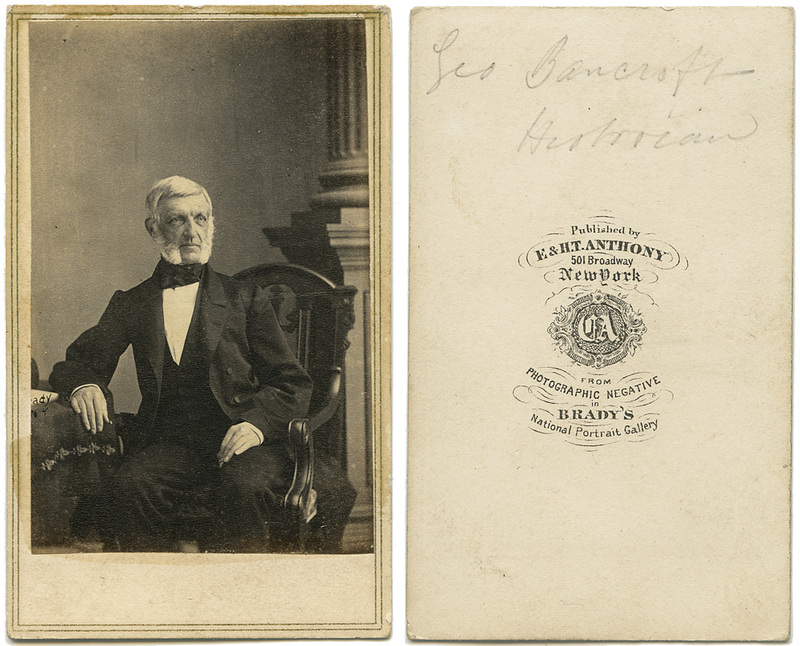 Here is an “Imperial” Carte-de-visite by Mathew Brady’s New York studio. It’s called an “imperial” because it is the size of what later came to be called a cabinet card (roughly 4 1/2 x 6 inches), whereas typical carte-de-visites are 2 1/2 x 4-ish (roughly the size of a modern business card). Whoever this gentleman was, he’s obviously quite dapper and very fashionable. I’m sure he’s someone famous and important, but I don’t know Victorian American personalities as well as I should. As a photographer, I’m wondering if either this was made with the same camera and lens as was used for the smaller images, or if this was shot by Brady himself instead of one of his assistants, because the depth of field is so shallow that at this size, his hand and leg closest to the camera are obviously out of focus. If this was shot by Brady himself, perhaps his eyesight was bad enough at this point that he didn’t realize the hand and knee were out of focus. If that was not the case, then it’s possible the fault lies with the lens – when you focus anything closer, the depth of what is in sharp focus in the image decreases. In order to project an image roughly 4 times the size using the same lens, you have to focus much closer and the depth of field will be noticeably shallower. If anyone out there has an opinion or better yet some historical fact to prove/disprove either or both possibilities, I’d greatly appreciate hearing from you. The inscription on the back is a bit cryptic – “Please Exchange”. Exchange for what? Unless they didn’t like the pose, I can’t see what’s wrong with it to want to exchange it. 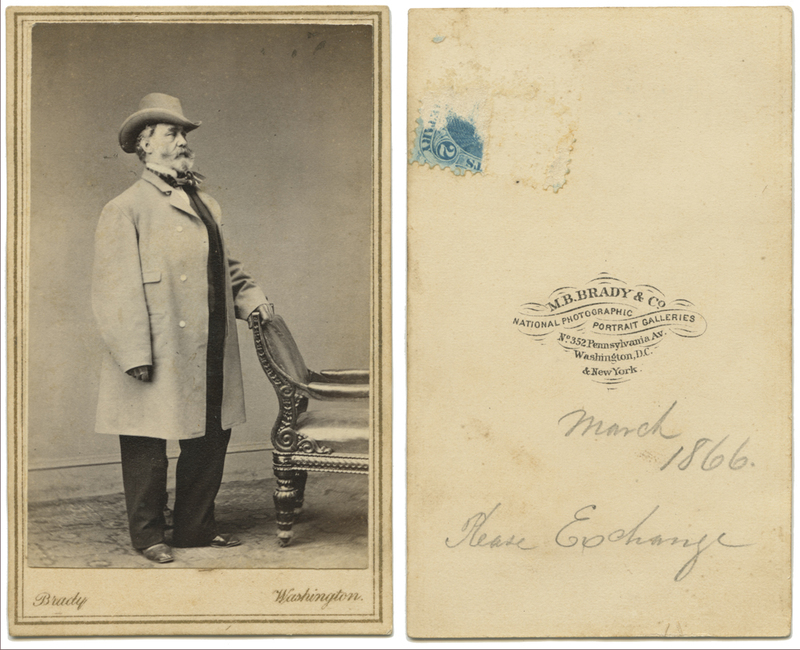 The CDV is actually in excellent condition, with no creases, bent corners, or overall flaws to the print. I’m certainly happy with it! He looks “western” with that hat and coat, but that’s not saying much – although the outfit has a cowboy feel to it, he’s obviously a very rich cowboy, as that’s a very fine coat. Brooks Brothers would be proud to hang such a coat in their showroom today. Anonymous Lady by W.J.L. Dyer, Washington DC. Also note the hand-coloring of her jewelry and the faintest touch of rouge on her cheek. This is not bad, but I’ve definitely seen better quality hand-coloring on CDVs. Mr. Dyer’s studio, while in the same neighborhood, must not have been a direct competitor to Gardner and Brady. I was reading about the Brady studio in the immediate antebellum years and the first year or two of the Civil War, and it was a highly organized operation employing a wide range and large number of people. 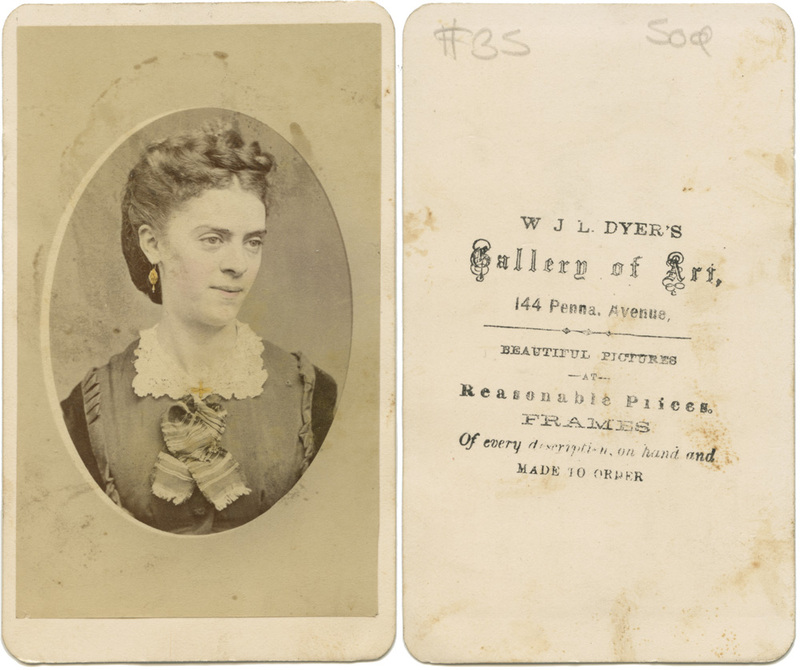 Their pay ranged from $8/week for the women who did the finishing work of pasting the photos onto the cartes and other similar tasks up to the specialists who retouched and hand-colored his Imperial prints who got between $11-$16.66 a day (the bonus was paid for working on a Sunday). I doubt Mr. Dyer’s hand-colorists were making that kind of money. I got this one to add yet another address to my DC photographers’ map collection. I’ll have to look into making the map interactive with representative CDVs from each studio pop up when you mouse over the address. But that’s a programming feat for another day, and something to tackle relative to my day job (believe it or not, I do have a day job to pay for all this insanity – I do software developing). It would actually make a pretty cool portfolio piece for my development career.